Can either of you post a photo of the C-posts in Hammerite please? Did you both use the hammered finish? The vinyl on mine isn't bad, but there are signs of it coming away at the top edge. I got the time to have a look at the wet floor issue yesterday. I stripped back the sound deadening material from the bulkhead and found that although there is surface rust, there are no holes or weakened metal, so I'm pleased about that. Having looked carefully at where the water appears in the car I am 99% sure it gets in round the clutch master cylinder which I replaced last year. There is an air box drain right above it which makes sense to me. So after cleaning up the rust and treating it I intend to fit a thin gasket with sealant between the clutch cylinder and the bulkhead and I hope that will sort it. We shall see! As requested I will attach a photo of the painted C panel. Thanks for the picture Richard. The paint doesn't look at all out of place, and a lot better than scruffy vinyl. Mart, if the rear pillar is the D-post, where is the C-post? I would say the screen pillar is A, the door pillar is B and the rear pillar is C. The quarter light supports surely don't count? Front door hinges on the 'A' post. Front door latches on the 'B' post. Rear door hinges on the 'C' post. Rear door latches on the 'D' post. Can't remember where I got this from...Alun? But under your scheme the B and C posts are the same thing. I shall continue to call them A, B and C. You need a stretch limo with three doors on each side to have a D post! Bumba, I concur with your analysis. According to your analysis the 'B' post and 'C' post are one and the same structure. My 1973 VW "1600" Type 2 campervan has "A", "B", "C" & "D" pillars. The pre-1968 split-screen VW Type 2s have even more! Having only a circa 1978-vintage, Olympus OM2 SLR camera with 35 mm colour-reversal film for taking pictures, I won't be in a position to provide any pictures of my hammered-finish, black Hammerite painted roof and C-pillars for the foreseeable future. The advantage of the hammered-finish is that it effectively camouflages all manner of underlying imperfections. I also later used this paint for the lower vehicle sides up to the lower swage lines and around the front wheel arches, which also mutes the large expanse of Mimosa-yellow paintwork. 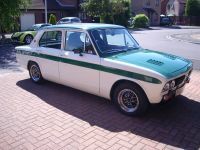 Or an estate car/station wagon! PS The C pillars are only called D pillars on a Dolomite because they have a big D written on them! So does a Sprint have a 'Sprint' post? Mart, you're such a wit!